This blog post is in partnership with Backcountry.com. All opinions are my own and true! 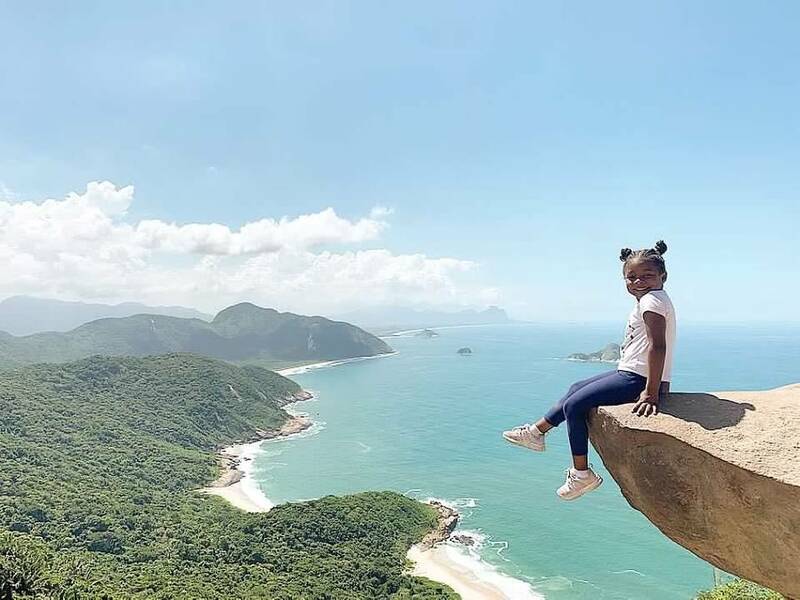 When planning our Rio de Janeiro vacation visiting Pedra do Telegrafo was a must. 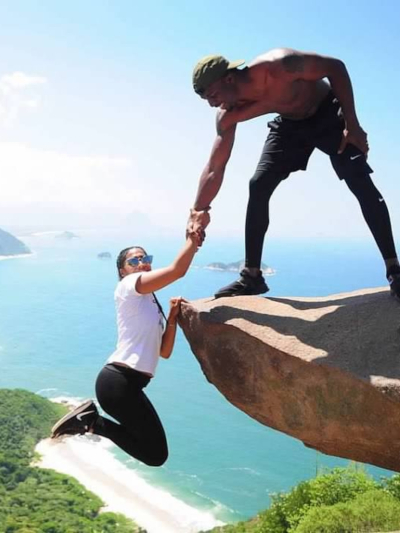 We’d seen photos of the optical illusion photos of people “cliff hanging” all over Instagram and wanted the same. We knew it was in Rio but we didn’t understand the logistics of getting there. It wasn’t what we expected so we want to share our experience. 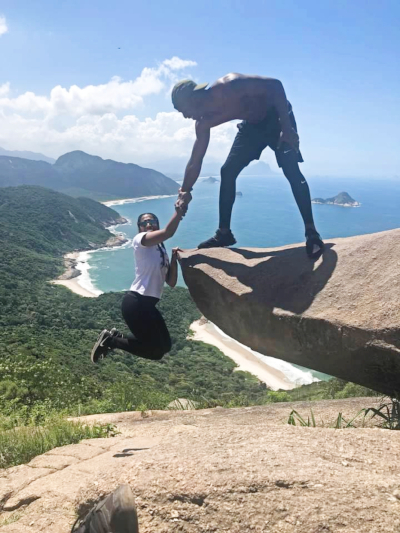 Here is everything you need to know about visiting Pedra do Telegrafo. 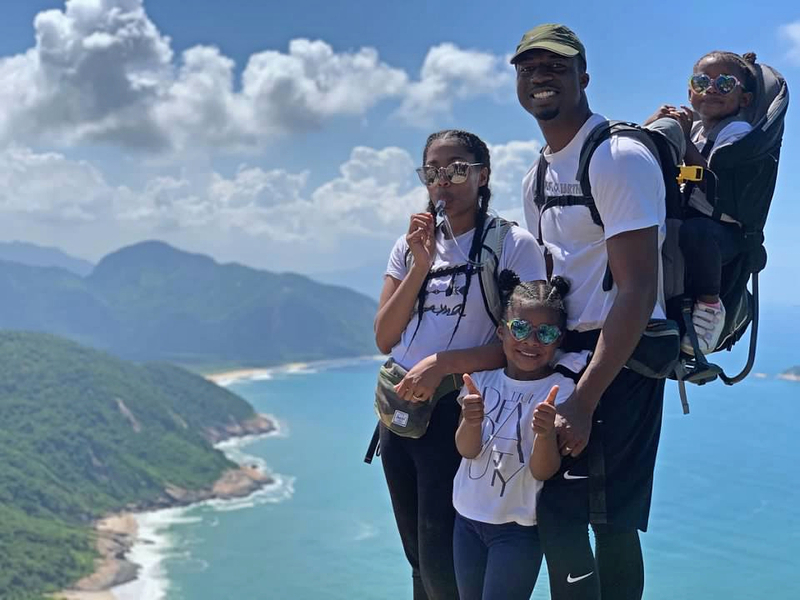 When planning our visit to Pedra do Telegrafo we had no idea it was actually a 90 minute drive from the Copacabana area. There are three ways to get there, you can take the bus, take a tour, or hire a private driver. 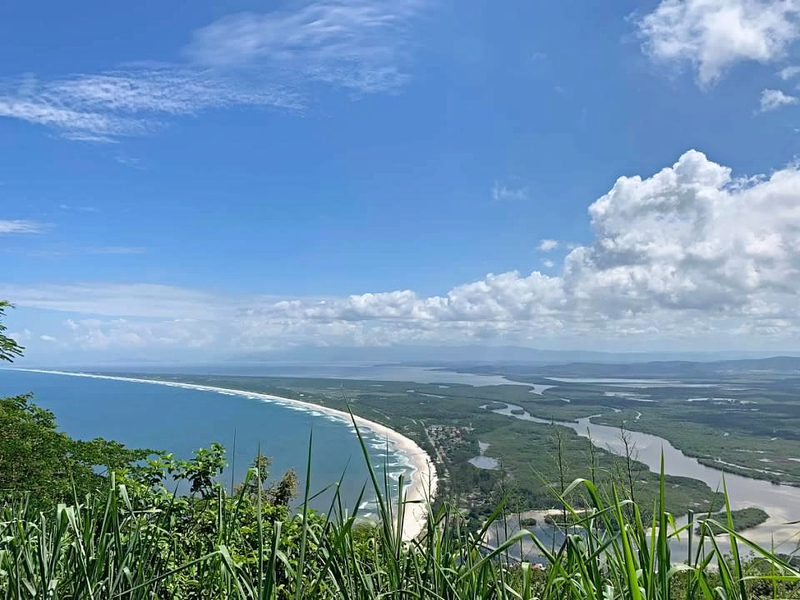 For ease, comfort and budget we chose to hire a private driver but here’s how to take the bus to Pedra do Telegrafo if you’re feeling adventurous. I honestly don’t recommend this route unless you are comfortable speaking Portuguese and understand you may potentially wait a long time for a bus. From Rio de Janeiro you will need to get to Terminal Alvorada. When you get to Terminal Alvorada take one of the blue express buses to Malto Alto station. Once you arrive at Malto Alto station you’ll need to take the local bus 867 towards Barra de Guaratiba. You will get off the bus at the Barra de Guaratiba stop and walk towards the yellow church. There are a set of stairs besides the church leading to an alleyway. If you’re unsure if you ask any local you see they will be able to point you in the right direction. The alleyway is where the hike to Pedra do Telegrafo starts. You will soon see yellow painted footprints on the ground which will guide you to Pedra do Telegrafo. While the official start of the trail to Pedra do Telegrafo is 1km there is about a .2km hike prior to arriving to this sign. Most people take about 40-45 minutes to make the hike but since we were traveling with a 3 and 4 year old it took us an hour. If my 4 year old can make the hike up and down by herself you can definitely make it so don’t be intimidated by the amount of time it takes. 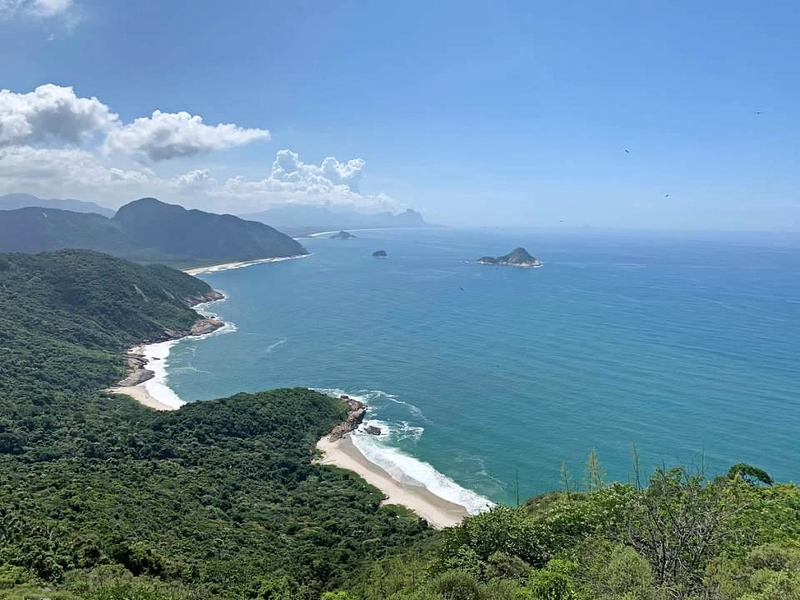 The Rio sun is no joke so thankfully the hike to Pedra do Telegrafo comes with plenty of shade to block you from the burning rays. Hiking up there will be some steep and tight areas so be prepared for those. This not the activity to wear sandals or flip flops, you need sneakers. If you get tired and need a break there are plenty of places to rest on the way up to Pedra do Telegrafo. 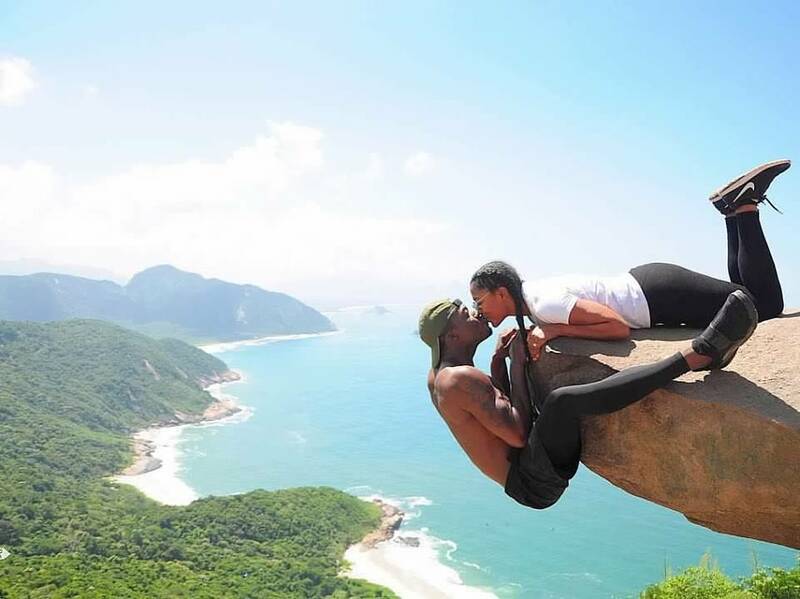 Lucky for you these places are typically on a rock that has an epic view of the beach below. We also came across a gentlemen at about the halfway point that was selling water and snacks. Like most hikes there are no toilets on the way to Pedra do Telegrafo. If you need to use the restroom you’ll have to find a hidden place off the path and be one with nature. Be sure to hike with toilet paper and a bag to put any trash in. Once you make it to the top you can expect the most breathtaking view you’ve ever seen. However, depending on the time you arrive that view could be obstructed by a massive line of people waiting to get their own optical illusion cliff hanging photos! We finished the hike to Pedra do Telegrafo at 10:00AM and the line was already quite lengthy. I read the line can sometimes be 6 hours to take a photo and we thought by leaving Rio at 7AM we’d beat the crowd. When we saw the line we wished we had arrived to the start of the hike at 7AM. We waited about 45-60 minutes until it was our turn to take photos. If there is one than one person in your group you can switch off waiting in line while the other person sits in the shaded area. 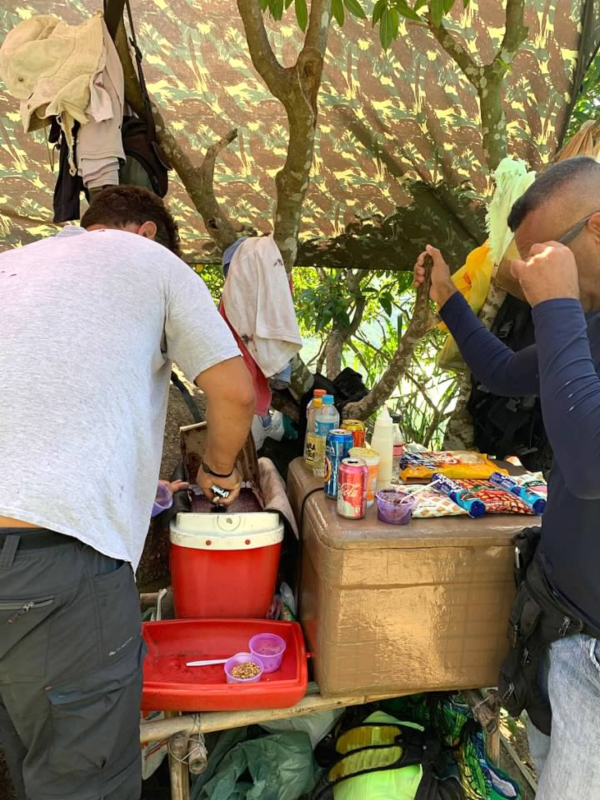 There is another person here at Pedra do Telegrafo selling snacks and water for you to enjoy while you wait. Before getting to Pedra do Telegrafo I stalked other people’s Instagram photos to see what type of fun shots we wanted to take. While I knew what we wanted I honestly wasn’t too sure how we’d take them at the right angle to get the death defying effect we’d seen all over the internet. Luckily we didn’t have to worry about that! There is a photographer stationed at the top ready to take your pictures. The photographer is a pro at capturing these photos at the right angle. When we went he was charging $5 for 10 photos taken on his Nikon. Not only did he take pictures on his camera he takes them with your phone if you’d like a well. There was no obligation to purchase his professional pictures even if he took some for you on your phone. He did such a great job, I don’t know why you wouldn’t purchase them or at least tip him. He tells you exactly what to do and really we got great photos. Here is what the whole area really looks like. If you choose to purchase the professional photos he will give you his business card with his website. You’ll be able to download your pictures that night after 9PM. He does put a small watermark of the left hand bottom corner of the photo but it is extremely easy to crop it out. You will need plenty of water to make the hike to Pedra do Telegrafo. While there is someone selling refreshments once you get to the cliff you’ll need water on your journey. CAfter our many hikes on our Southwest road trip and in Costa Rica we learned carrying large water bottles is annoying. This time we invested in the Osprey Hydration Backpack and I’m glad we did. You can fill it with 2.5L of water and comfortably carry it on your back. There is a long straw attached to the pack allowing you to easily drink without removing the backpack. The backpack can also hold items like extra clothing. When I’m hiking my clothing typically doesn’t have pockets to store items like my phone or keys. This was true for our hike to Pedra do Telegrafo and that’s why I always hike with my Herschel fanny pack. To me it’s more convenient than having to constantly remove my backpack to retrieve my items. If you are traveling with young children like we were I highly recommend using a carrier. If you’re child can’t walk or gets tired of walking you won’t want to carry them in your arms. 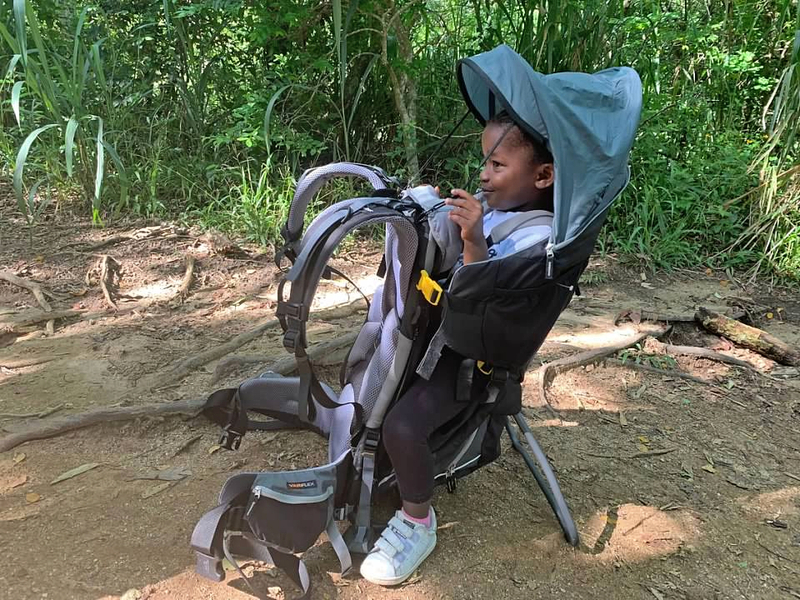 Our favorite hiking carrier is the Dueter Kid Comfort III. We love how easy it is to get your child in and out, that is comes with a shade, and so many other features. We got all of our hiking gear from Backcountry.com. You can use promo code HAMBRICKS15 for 15% off your first purchase. 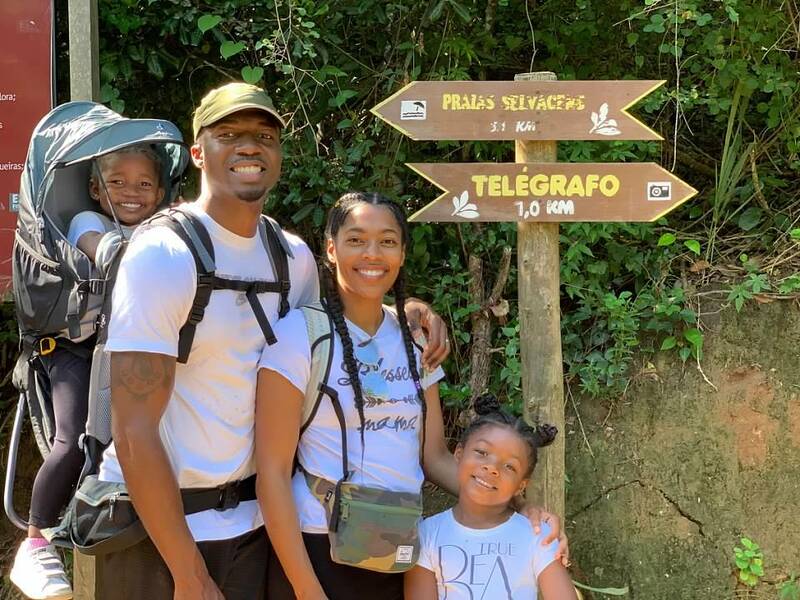 Hiking to Pedra do Telegrafo was one of the highlights of our Rio de Janeiro vacation. When you’re done with your hike you’ll probably want to cool down and relax. There are three beaches that you will pass driving back to the Copacabana area of Rio de Janeiro. It’s a good idea to make the Pedra do Telegrafo hike an all day adventure. You can relax on one of the nearby beaches afterwards, they are much better than Copacabana beach. Grumari Beach is good for swimming, Prainha is great for surfing and Macumba Beach is good for swimming and surfing. 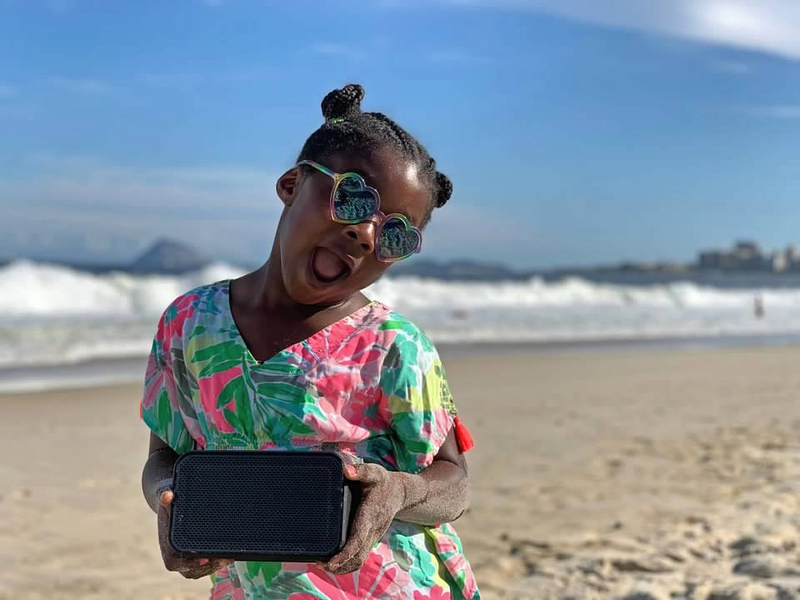 We love using our Skullcandy Barricade XL Speaker at the beach. Not only is it Bluetooth capable, there are USB plug so you can charge your phone and it’s waterproof. You don’t have to worry about it getting wet and you can feel free to take it in the ocean with you! We also got it from Backcountry.com and you can use promo code HAMBRICKS15 for 15% off . 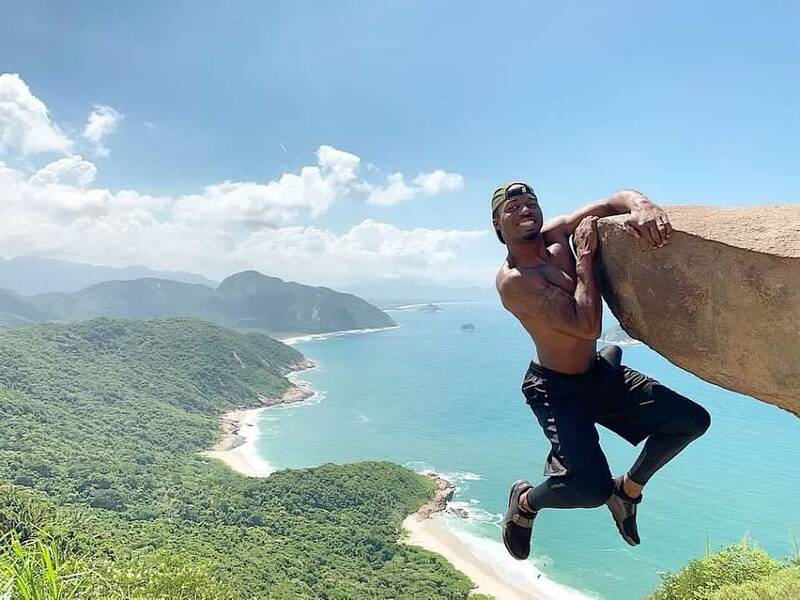 I hope you get the most epic cliff hanging photos at Pedra do Telegrafo. You’ll want a good meal after this hike so check out the best restaurants in Rio. Did you find this article helpful? Please share it! Awesome information. You made this adventure so attractive, it is now a must do on my bucket list.